The tumble control valve position sensor is a non-contact type sensor. The position sensor measures the opening angle of the tumble control valve. The sensor is reliable and accurate, as it is electrically controlled by Hall elements. 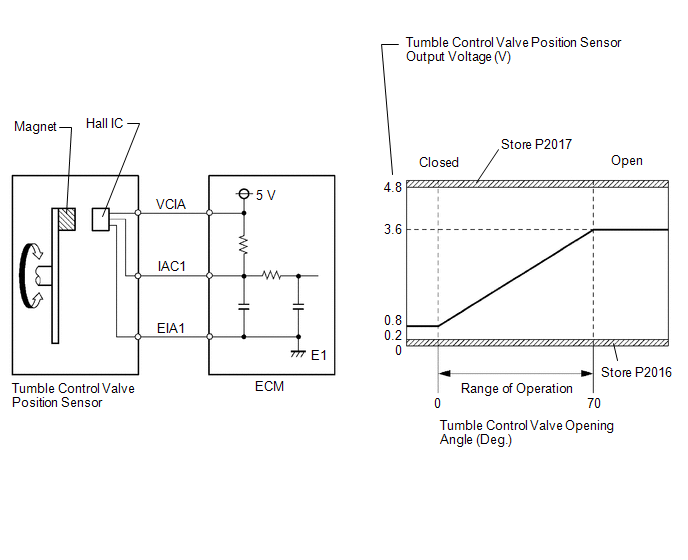 The tumble control valve position sensor output voltage flutters up and down beyond the normal operating range (below 0.2 V, or higher than 4.8 V) for more than 0.5 seconds (open or short) (1 trip detection logic). The tumble control valve position sensor output voltage is below 0.2 V for more than 0.5 seconds (short) (1 trip detection logic). The tumble control valve position sensor output voltage is higher than 4.8 V for more than 0.5 seconds (open) (1 trip detection logic). 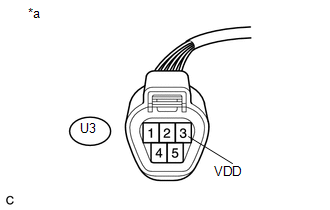 After confirming DTC P2014, P2016 or P2017, use the Techstream to confirm the IAC Sensor Voltage (tumble control valve position sensor output voltage). Enter the following menus: Powertrain / Engine / Data List / IAC Sensor Voltage. The ECM IAC1 terminal voltage increases in correlation with the opening angle of the tumble control valve. When the tumble control valve is fully closed, approximately 0.8 V is applied to the IAC1 terminal. When the tumble control valve is fully open, approximately 3.6 V is applied to the IAC1 terminal. When the output voltage of the IAC1 terminal deviates from the standard range, the ECM determines that a malfunction has occurred in the position sensor and stores a DTC. Allow 0.5 seconds or more to elapse. Input the DTC: P2014, P2016 or P2017. (c) Enter the following menus: Powertrain / Engine / Active Test / Control the IAC Duty Ratio / IAC Sensor Voltage. (d) Check the output voltage of IAC Sensor Voltage while changing Control the IAC Duty Ratio from -100 to 100% (or from 100 to -100%) using the Techstream. The voltage output of IAC Sensor Voltage remains between 0.2 and 4.8 V while Control the IAC Duty Ratio is changed from -100 to 100% (or from 100 to -100%). (c) Clear the DTCs (See page ). (d) Turn the ignition switch off and wait for at least 30 seconds. (g) Drive the vehicle in accordance with the driving pattern described in Confirmation Driving Pattern. (a) Replace the intake air control valve actuator (See page ).